Texas fare feeds diners at this lively, family-friendly Decatur spot. : Big Tex sports a large, friendly bar and huge screened-in patio, and the interior abounds in good folk art; we like the paintings by Georgia’s John "Cornbread" Anderson. It’s a lively, family kind of place, especially on weekends, and serves the entire social stratum. Texas flavors shape the menu, with brisket-filled tacos and chicken-fried steak. 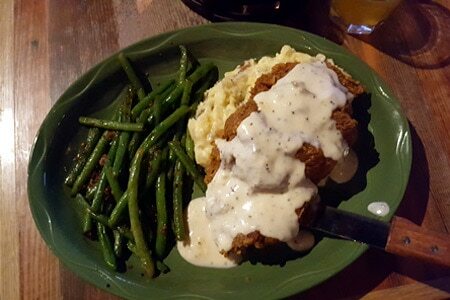 The latter, served in a portion big enough for two, is properly fried and served with mashed potatoes and cream gravy as well as nicely cooked fresh green beans. This admittedly meat-centric experience also offers vegetarian-friendly dishes, such as the fried green tomatoes slider, roasted creamed corn and mac 'n' cheese. The Mexican side of Texas cuisine comes out in carnitas, flautas and nachos. Kids age 12 and under have a special menu. Desserts tend to be traditional, ranging from pineapple upside-down cake to coconut cake and banana pudding in a jar. None has ever disappointed. Choose a beer from a long list to pair with the food.